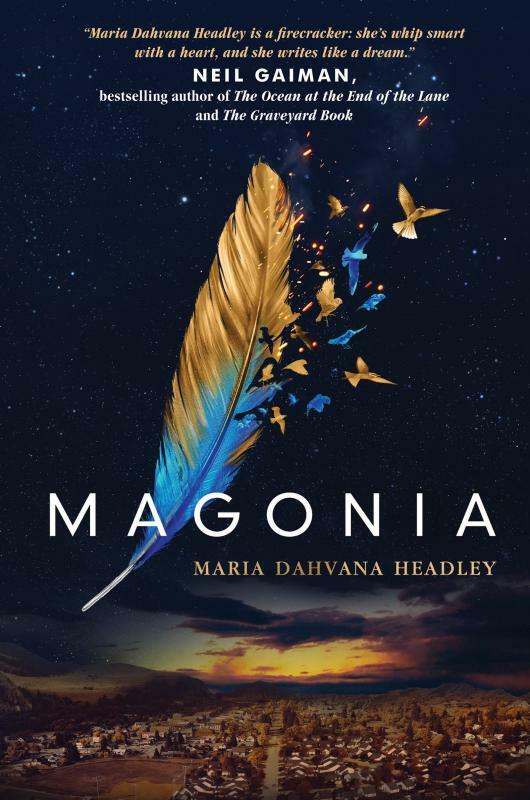 Magonia, by Maria Dahvana Headley, is about a young girl named Aza. Aza has been dying of an unnamed disease that makes it difficult for her to breathe- as if she’s drowning in air. Her mother has been working on treatments since before Aza can remember, and her dark humor has pushed most people away, except Jason. He’s been her friend from the beginning, and even death won’t keep him from being there for her. Then, Aza’s health takes a downward turn. She hallucinates a ship flying in the sky, with someone calling her name. But are they hallucinations? Before she and Jason can figure out exactly what she saw, her lungs finally give out. When Aza wakes, she’s in another place, with customs she doesn’t understand, on a ship flying high in the sky. The only thing that makes it bearable is the fact that she can breathe! Finally, Aza has become what she’s meant to be. But will she ever get back to her family and the boy she loves? Much like the cover suggests, Magonia reminded me a little of Neil Gaiman’s work. Specifically, Stardust and the sky pirates. Headley does a great job of creating a new, fantastic world- the likes of which I’ve never read. Also, I cared for the characters, felt their pain, and rooted for them. The uniqueness of this tale makes it stand apart from others in the YA genre. Too much was crammed into one story. The problem with creating a whole new world is that you have to spend a lot of time explaining it to the reader. Thank God it wasn’t another vampire novel, but at the same time, we understand vampires already. When you read a novel about vamps you can simply focus on the story without a ton of explanation. Another thing I didn’t like: the writing style. Parts of the story were very poetic and beautiful, but other parts were so strange, I just didn’t get it. There were a lot of brackets and odd spacings put to use for effect- especially in the way Jason and Aza communicated with each other. Yes. It was entertaining, and I’d buy the next one. Plus, the cover is gorgeous, so this one looks nice on a bookshelf if you’re trying to decide whether to buy Magonia or head to the library. Either way, it’s worth a read. What do you think? Will you check Magonia out? Have you already? Let us know in the comments section. This entry was posted in Jen P, Reviews, Reviews: BOOKS and tagged Aza Ray, books, Jen P, Magonia, Maria Dahvana Headley, Neil Gaiman, Review, Reviews, Stardust. Bookmark the permalink. ← The Liebster Award… #2! That’s how I felt. It was interesting, but not the best thing I’d ever read. Neil Gaiman put his stamp of approval on it. That’s enough to get me to read it.